Welcome to the Greater Plains Collaborative! 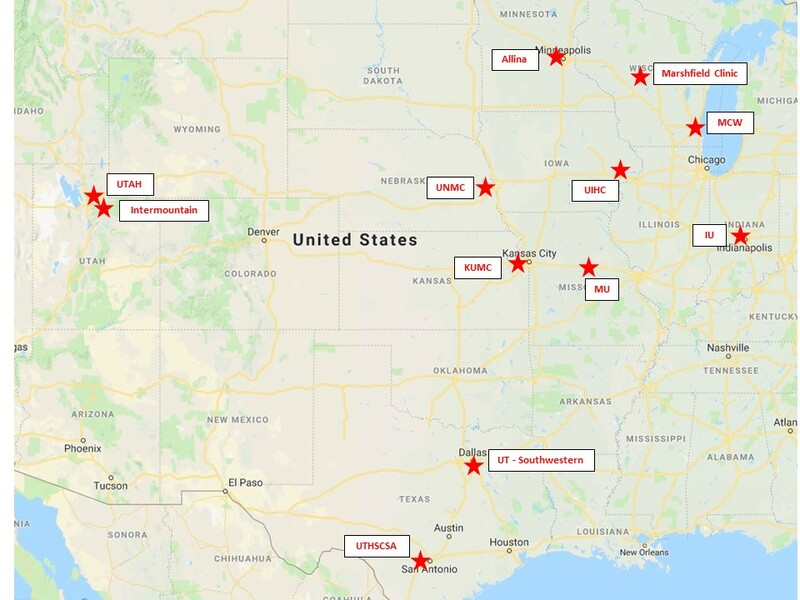 The Greater Plains Collaborative (GPC) is a network of 12 leading medical centers in 9 states committed to a shared vision of improving healthcare delivery through ongoing learning, adoption of evidence - based practices, and active research dissemination. The GPC builds on strong research programs at our sites, existing community engagement and informatics infrastructures and data warehouses developed through the NIH Clinical and Translational Science Award (CTSA) initiative at most of our sites, extensive expertise with commercial EHR systems and terminology standardization, and strong working relationships between investigators and healthcare system information technology departments. Our network brings together a diverse population of over 19 million patients across 1300 miles covering 8 states with a combined area of 679,159 square miles. For additional site specific data available through the GPC, please review the Site Level Data Characterization. The Greater Plains Collaborative CDRN is pleased to announce our 2017 Inter-Institutional Pilot Program. This program is open to investigators affiliated with our GPC institutions. Julie Panepinto, MD (Medical College of Wisconsin): "Building blocks of a learning health system (LHS) for children with sickle cell disease"
Mary Schroeder, PhD (University of Iowa): "A Pilot Test of an Innovative New Integrated EMR-Cancer Registry-Administrative Claims Data Resource in a Clinical Data Research Network"
Bradley Brimhall, MD (University of Texas Health Science Center at San Antonio): "Multi-Institution Comparison of Inappropriate Clinical Laboratory Testing Patterns"
Erin Doren, MD (Medical College of Wisconsin): "Comparison of Outcomes and Cost-Effectiveness of Unilateral Mastectomy and Contralateral Prophylactic Mastectomy with Reconstruction in a Multicenter Cohort (Cancer Cohort)"
Reem Mustafa, M.B.B.S, PhD (University of Kansas Medical Center): "Burden of Imaging in Renal Cysts"
Neena Sharma, PhD (University of Kansas Medical Center): "Opioid and Rehabilitation Following Lumbar Spine Surgery: A Cross Section Study"